» Mbewu Movement- One Africa For ALL Africans! Flashback to February 2005- I just arrived at my university res and as I am unpacking my bags with my mother I am introduced to my roommate for the year, the first person I have ever met from Botswana. Flashback to July 2008- I am at a “traditional” Bahia ceremony in Brazil, everything to the ginger beer that we drank feels like I am attending umsebenzi. Flashback to first semester 2010- My African Politics lecturer tells us the story of when he was in primary school in the 1970s in Ghana, and as a kid they were regularly instructed to bring 20c to school. When he investigated this as an adult, it turned out that the Ghanaian government was using this money to fund the South African liberation movement. Flashback to October 2010- I am walking through New York, dazzled by the skyscrapers and the lights. A young man approaches me on a rickshaw in Central Park, tells me I look African and offers me a free ride around the park and Maddison Avenue. I hop on the rickshaw and he tells me his story of moving from Burkina Faso to the United States to study in university. Flashback to December 2011– I fall deeply in love with a Swati man on one of our first holidays together in Mozambique. Flashback to June 2012- My Algerian friend takes me to a nightclub in Paris for my birthday. A young Senegalese man approaches me asking if I speak French, I respond that I don’t. He asks me where I’m from, I say South Africa. He starts to serenade me with a Lucky Dube song. Flashback to Feb-July 2013- I am seconded on a project in the UK and my new work environment is very European and male dominated. One of the first friendly faces in the office to introduce themselves to me is a young, beautiful and passionate Somali woman, who became a very close friend and confidante. Flashback to April 2013- It Is sunset and I am sitting on the back of a camel, marveling at the pyramids of Giza in front of me and listening to the call to prayer echoing from the Cairo. Flashback to April & August 2014- I witness my sister and her Ugandan husband get traditionally married in ceremonies (in Johannesburg and Kampala) that were a spectacular display of pride and the beauty in diversity. Two families were united by their children’s boundless love for one another. Flashback to November 2014- My family lay to rest an incredible Zimbabwean man. My uncle continuous to be sorely missed by all those who had the joy of knowing and loving him. Flashback to March 2015- I am meditating in the peaceful mountains of Lesotho. Flashback to April 2015- I am dancing the electric slide to Mafikizolo with the wedding party at a friend’s wedding in Windhoek, Namibia. When I think back to these fond memories, of feeling appreciated as an African and learning from other Africans around the world through simple yet deep interactions and acts of kindness, my heart bleeds with shame and anger at the way fellow-South Africans treat and view our counterparts on the continent. I condemn these violent attacks and I call upon leadership to prioritise this social cancer as a matter of urgency. We live in a time when our national identity continues to be challenged by various parameters and isms. On the one hand, we present ourselves as an example of peaceful transition under exceptional circumstances, a bastion of a liberal constitution with progressive human rights, and the cradle of humankind. On the other hand, our rage consumes us to the point where violence and killing comes so instinctively. Acts such as this cannot happen again under our watch. 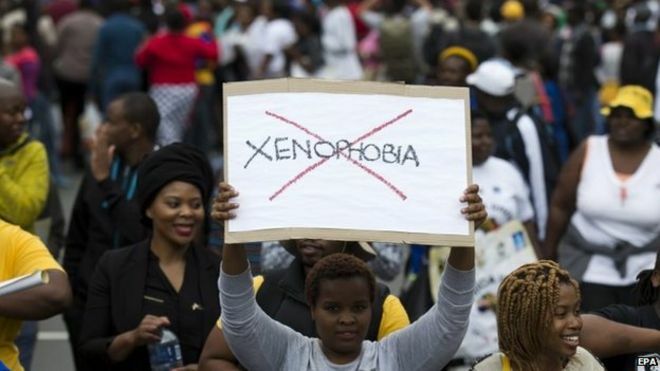 I echo the same sentiments as many like-minded South Africans- there is no place for xenophobia in a democratic South Africa. We certainly live in absurd times, no surprise there. In the age of the ‘knowledge society, globalization and the digital connection’, the dark cloud hanging over (South) Africa clearly exemplifies otherwise. I, a 27-year-old (‘Black’) South African Female, born and raised in South Africa (eMzantsi) have not a molecule of even trying to comprehend the inhumane act of violence my fellow South African brothers and sisters are imposing on our fellow brothers and sisters from the continent. I grew up in a household where my mother introduced ‘uncles and aunties’ to me who were family from all walks of the African continent. I had an uncle who was a doctor from Malawi, an uncle from Tanzania, an aunty who made my mother beautiful garments from Nigeria, an aunty who did my mother and I’s hair from Ghana, aunts and uncles from Lesotho, Botswana, Zimbabwe…so I was raised knowing that my family was from all of Africa. When the Xenophobic attacks started, a friend of mine, Katleho Shoro, challenged us with what if we (South Africans) highlighted our intimate and love-filled relationships with the rest of our continent instead. So Mam’Africa, here is my thank you. Swaziland, you gave me life, strength and a mother whom I pray I leave this earth half the woman that she is. Thank you that I get to call her Mama. Zimbabwe, you not only lit up my life with a man whom I thank my God for but also with friends whom I consider brothers and sister, elders whom I consider parents. Mozambique, you have truly given me a sister in a friend whom I will always cherish. Kenya, you have brought me so much love and the gift of being accepted as I am, she knows her name. Nigeria, how grateful I am for such a mentor and leader in the workplace. Zambia, Malawi, Lesotho, Botswana for the new friends and for the old friends, I will forever be grateful. This is me, one South African, who would not be who I am today without you. Thank you is not enough. I am Zambian born and South African raised, including a 1 year interval in Swaziland. My parents came to South Africa to further their studies in the medical field through the recommendation of their close friends who were part of the ANC, then head quartered in Lusaka. So I consider myself an African citizen. South Africa is my home, it is where I’ve completed all my formal schooling, where I had my first love, my first heartbreak, my first job, where my siblings were born and it is against the South African back drop that I am who I am today. So when I read a blow-by-blow account, in the Sunday Times, of how a Mozambican man was attacked unprovoked and murdered, I feel like an alien. Surely this can’t be the same country that represents all things diverse? The same country that has the largest Indian population outside of India, the same country that legalized gay marriage ahead of most western countries? This doesn’t make sense to me…It infuriates me, saddens me and defeats all hope I had in ourselves as Africans. Where is our humanity? Where is our tolerance? How do the very people who survived and triumphed above the systematic suppression of the black majority just some 20 years ago treat their fellow Africans in such a manner? My only hope is that we rise above and replace self-hate with self-love. And if our history, the AFRICAN history, is anything to go by…we will. We are resilient, we are survivors, and we are conquerors. God bless Africa. In my 26 years of life, I have grown to know that boarders are far less important than the people who inhabit them. I know that whether you come from the west, or the east, or the north, or the central, or the southern part of my beautiful native land; we are all children born of the richness of Africa’s womb. Because the people who inhabit these boarders we are so quick to define, are more like us than the tourists and the expats we are so cordial and accommodating to. No matter where you go, an African child will know that a village raises you, and that whatever you have is never yours alone but to be shared with those around you. We have more to learn from our brothers and sisters than we are willing to admit, we have more to teach our brothers and sisters than we are aware of. I know this because the friends I have made in my short years have taught me the sweetness of relentless hard work, the courage it takes to dream, the importance of setting goals, the necessity to laugh and not forgetting to “Fear God Now”; my dear friends have taught me that for as long as I am able, I can! For that I thank the people of Zimbabwe, Nigeria, The Democratic Republic of Congo, Tunisia, Zambia, Rwanda, Tanzania, Botswana, Swaziland, Malawi, Ghana, Cameroon, Uganda and Kenya. Ma-Afrika, we are because these nations stood up when another was oppressed, we are because your pain is my pain, and your suffering mine, and your joy is my joy. We are because they are. South Africa is one of the most complicated countries in the world. We have a very painful past (pre and post apartheid) that has left us with grave consequences, 21 years into our democracy. There are elements that we could have predicted, and others we couldn’t have. Afrophobia is one such consequence. We can go in circles about ultimately who is to be blamed for the recent attacks on foreign nationals as well as the root causes. I have just one –Black Consciousness. You hate on your blackness, you hate on yourself. South Africa, do we hate ourselves? Stop the hate. Arriving in SA in August 1992 with only a few bags, as a young 6 year old girl, with my parents and 10 year old brother… I had no idea what to expect! All I knew was that we were in Africa. We were here as a result of a civil war which broke out in my country of birth, the former Yugoslavia. My parents came to seek a place of safety, hope and a brighter future for us, their 2 young children. As I stand here today and think back to how our new life started, I remember it like it was yesterday… Yes, certainly a tough start for my family, but, I have fond memories of the opportunities that this country has afforded me. It welcomed us, it gave us hope and a place to call our new home. Let’s continue to live, love and laugh in harmony. This is why we are the Rainbow Nation. Let us not forget where we come from and how far we have come. Let’s not lose our path. Please let’s stop this… May God bless our nation in this tough time!